Budget Management PowerPoint templates, backgrounds Presentation slides, PPT Themes and Graphics. Give your Budget Management PowerPoint the ultimate professional look with the help of these PowerPoint templates. You can share ways to create a free finance planner. This presentation can also allow you to share the best budget management software available in the market that can help the accounts department in preparing the sample program budget template. You can also include project management budget template and property management budget template which will help other departments also benefit from these PowerPoint presentations. You can explain the definition and concept of the finance management to your juniors which will benefit them in their future endeavors as well. Feel free to explain the definition and techniques used as a part of budget management. You can showcase ways to create free printable bill budget planner and free budget worksheet. These templates are customizable and can be ideally used to turn your textual slides into an awesome PowerPoint presentations. You can edit the templates after downloading to blend well with other aspects of your PowerPoint presentations. We present our business diagram templates 6 stage circular budget management chart PowerPoint.Use our Circle Charts PowerPoint Templates because Our PowerPoint Templates and Slides will Activate the energies of your audience. Get their creative juices flowing with your words. Download and present our Business PowerPoint Templates because Our PowerPoint Templates and Slides will Activate the energies of your audience. Get their creative juices flowing with your words. Present our Shapes PowerPoint Templates because you should Whip up a frenzy with our PowerPoint Templates and Slides. They will fuel the excitement of your team. Use our Process and Flows PowerPoint Templates because You are an avid believer in ethical practices. Highlight the benefits that accrue with our PowerPoint Templates and Slides. Use our Arrows PowerPoint Templates because Our PowerPoint Templates and Slides will definately Enhance the stature of your presentation. Adorn the beauty of your thoughts with their colourful backgrounds.Use these PowerPoint slides for presentations relating to Arrow, Blue, Business, Chart, Circle, Complex, Concept, Data, Diagram, Financial, Graph, Graphic, Green, Icon, Illustration, Isolated, Model, Pink, Process, Purple, Red, Round, Set, Shape, Vector, Wheel, White, Yellow. The prominent colors used in the PowerPoint template are Yellow, Red, Blue. Engage our Business Diagram Templates 6 Stage Circular Budget Management Chart PowerPoint and experience the difference. Get accustomed to consistent brilliance. Peolple choose counsellors with due care. 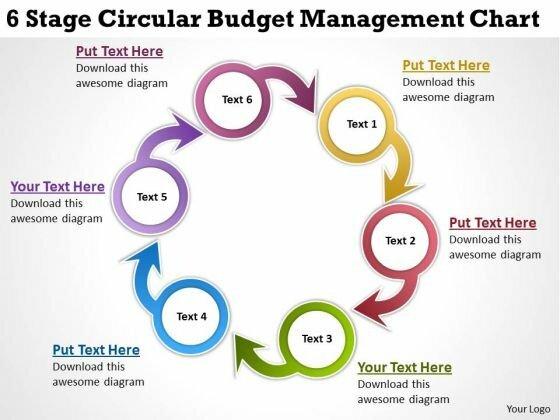 Convince them of your appropriateness with our Business Diagram Templates 6 Stage Circular Budget Management Chart PowerPoint.